Artist's concept of the Jupiter-size alien world TrES-2b and some hypothetical moons of the planet, which is nicknamed "Dark Knight" because it reflects less than 1 percent of the light that hits it. If you've ever wanted to catch a glimpse of a distant alien world, here's your chance. TrES-2b, a planet nicknamed "Dark Knight" because it reflects so little light, will cross the face of its host star Saturday (June 27) in a "transit" captured by the online Slooh Community Observatory. You can watch the free event — the first-ever live public observation of an exoplanet, according to Slooh representatives — live at 8 p.m. EDT Saturday (0000 GMT Sunday) at the Slooh website: www.slooh.com. "Saturday evening, Dark Knight will begin to cross in front of its star 28 minutes into the live broadcast, and will end its journey exactly 1 hour and 30 minutes later," Slooh representatives said in a statement. "Slooh will cover the whole event live, from start to finish, giving viewers a front row seat to the excitement, science, and mystery involved in observing an alien planet." TrES-2b, which lies about 750 light-years from Earth, won't be directly visible during the webcast. But viewers should be able to observe a slight dimming when the roughly Jupiter-size world crosses in front of its parent star (or stars, rather, since scientists think TrES-2b resides in a binary system) from Earth's perspective. 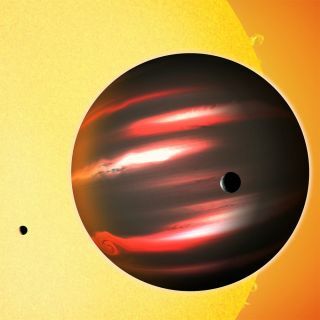 NASA's Kepler spacecraft, which has discovered more than half of the nearly 2,000 known exoplanets to date, employs this "transit method" to hunt for alien worlds, as do a number of other instruments. Indeed, TrES-2b was discovered via the transit method in 2006, by researchers studying observations from the Palomar Observatory in California and the Lowell Observatory in Arizona. TrES-2b is a "hot Jupiter," a gas giant that orbits extremely close to its parent star. But this planet doesn’t blaze with a bright, fiery glow. On Saturday, you can watch this dark, mysterious world gobble up a little bit of starlight.